Because we try so hard to focus on our experiences instead of our stuff, this time of year, we like to reflect on our favorite days, our favorite meals, favorite pictures, and our favorite memories of the year. My goal is to live a life where I give the good as much energy and enthusiasm as I give the difficult or terrible. Bad things will happen, and you have to give them the grief and time they deserve. But the more you can put equal effort, energy, and time into the good, the better life can be. From the outside, I may live a pretty boring mom life, but I am trying to make it as full and meaningful as I can. And to us, food is basically the heart of family, of experiences, of everything. We are pretty obsessed with food. We don't buy cars or clothes or much of anything, but we love to eat and travel. So thiese are our favorite from this year. Sometimes, you spend a whole morning at a Children's Museum and then it's time to eat. So you quickly look up what's good on yelp, and walk to a Hawaiian place a block away. 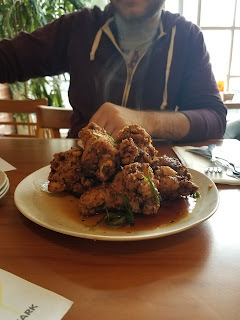 Doesn't sound like a life changer, but those wings were so so good. Crispy and delicious. 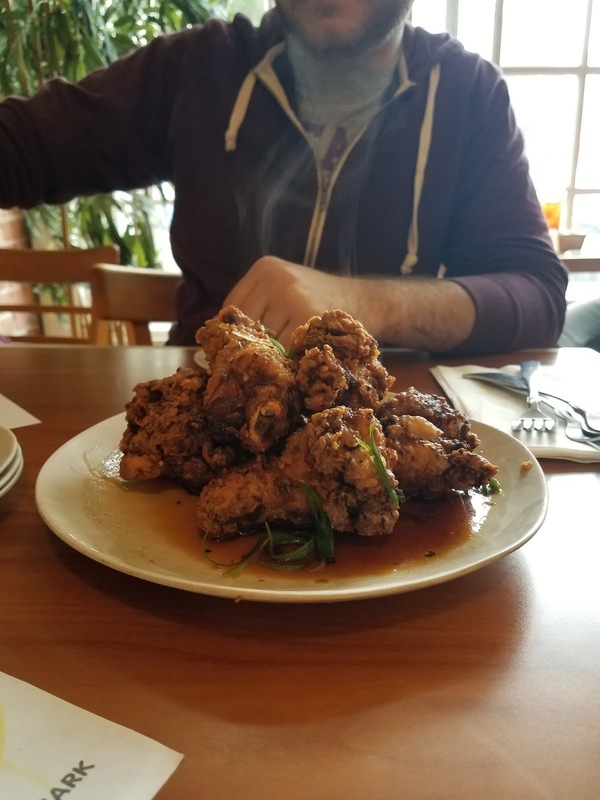 Finding good fried chicken doesn't happen everyday (or you will die) but every once in a while, it makes eating meat totally worth it. We took a trip to the South in September to see friends and family. 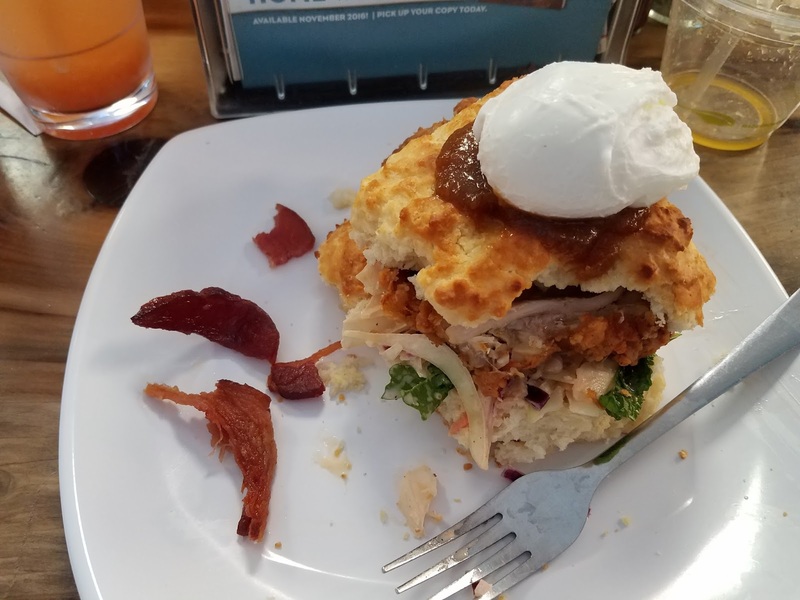 In Asheville, we stood in line for Biscuit Head, and I don't think the praise is undeserved. I knew we were in the right place when they had a Ron Swanson quote first thing through the door. I got the mimosa fried chicken biscuit which was sweet, spicy, and delicious, though way too big to eat it all. We also got a fruit plate for our baby that was epically huge. Southern people love giant food. 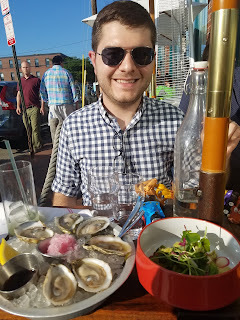 I was happy with the food and so excited for the company we ate it in. 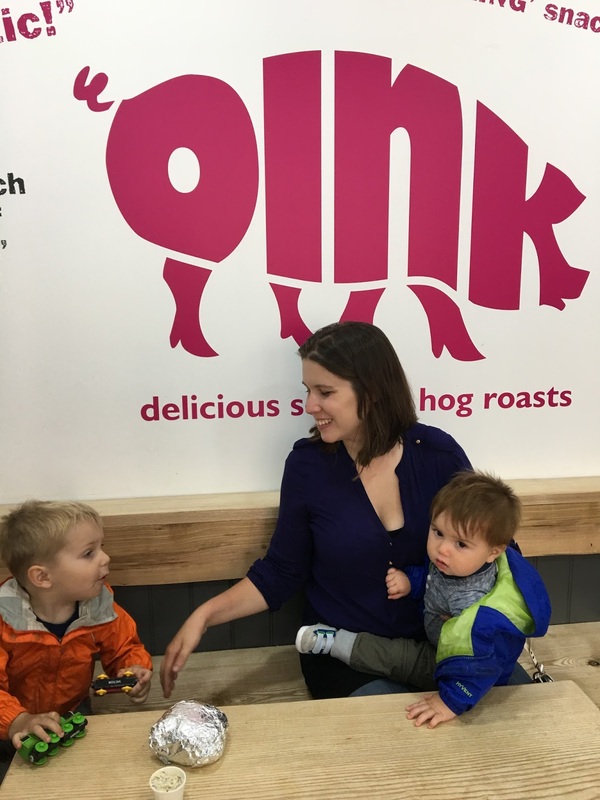 A gem from Edinburgh, this local chain makes sandwiches with pork, stuffing (you can get it with Haggis) and deliciousness. It was so simple and good. Not on the Boy's list, but he is wrong this was delicious. It says so right on the wall! The Boy got me tickets for Yayoi Kusama's Infinity Mirrors exhibition (so different than what I expected, but we had fun talking geneology with other Seattlites in line and I am still thinking about it). 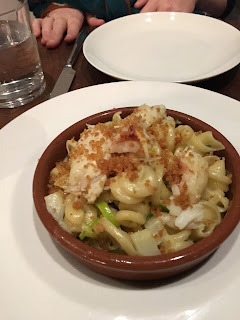 After our special weekday date, we checked out Matt's at the Market, which people say is one of the best places to eat down there. 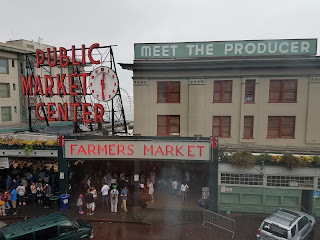 We had an awesome view of the market AND I ate the best scallops EVER. 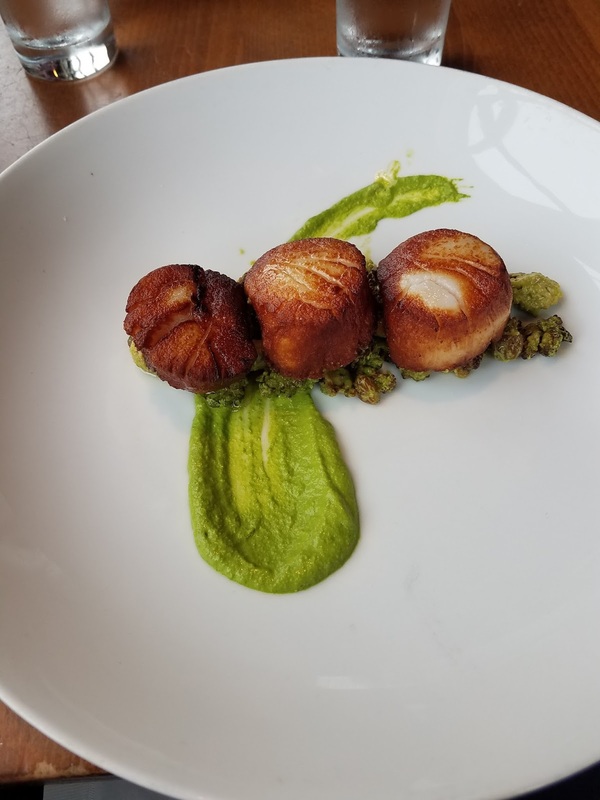 I know, scallops aren't the most exciting thing, but these were SO GOOD. Isn't the plate so pretty? 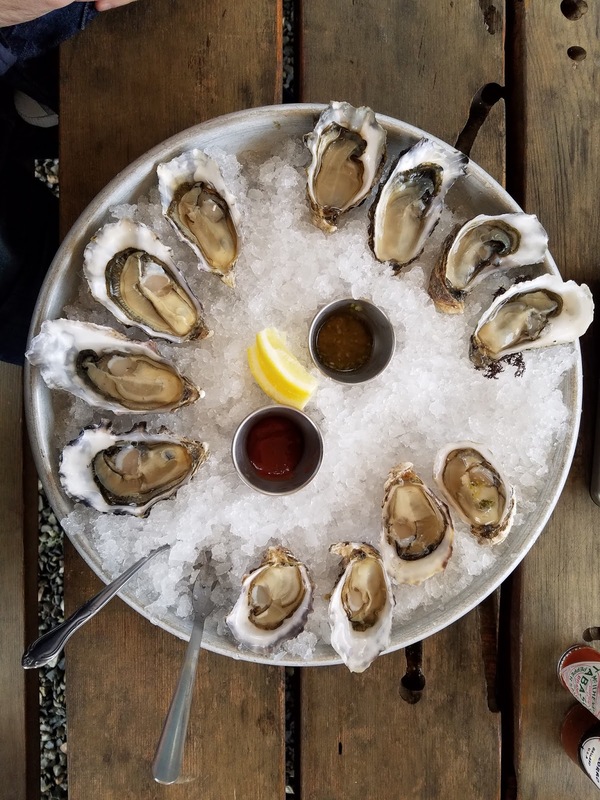 Can't wait to go back again, because this is definitely in my Seattle top 10 now. My friend Andre brought us amazing chocolate cookies when he came to have dinner at our house. What a friend! Problem was it was the middle of Lent and we had given up chocolate. We ate them to be gracious hosts- you can't turn down a guest's gift, right? They were the best chocolate cookies ever. Sorry, Jesus. Was it just breaking our Lent promises that made them so delicious? No, we went and got more later this year, and those cookies really are that good. They are from the Tom Douglas bakery, and I will be hankering for one everyday from here on. Even during Lent. 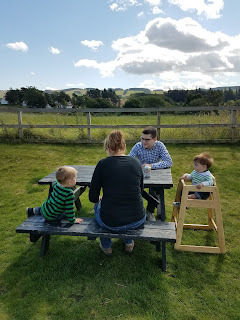 Our first full day in Scotland, we woke up around 11 (a full 5 hours earlier than the day before), and we headed downstairs to the little cafe in Humbie to have a completely memorable breakfast/lunch. 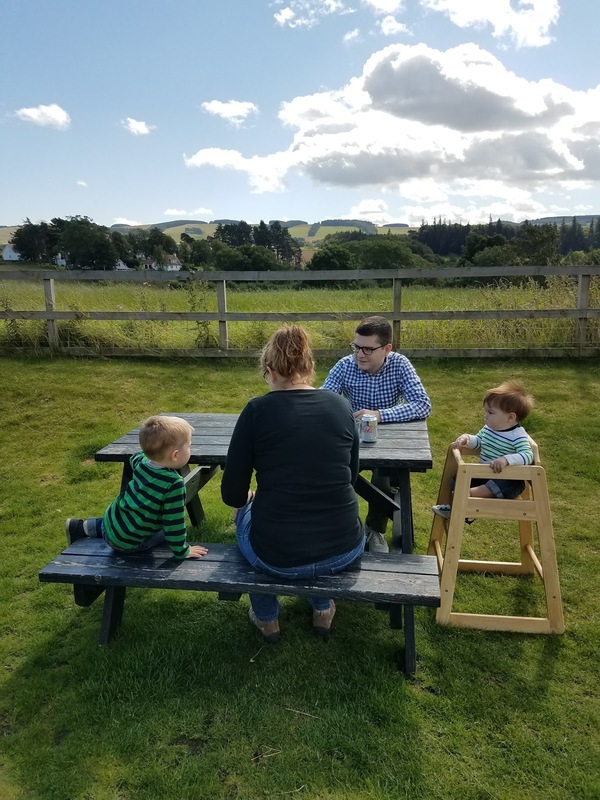 We got an Air BnB outside of Edinburgh, one of my favorite places we have ever stayed, which was on top of the small town's only shop and restaurant. It meant we could get fresh bread and Diet Coke whenever we wanted. It also meant we could have amazing sandwiches (and my favorite veggie tart EVER- I know it looks burnt but it was so good) by just walking downstairs. 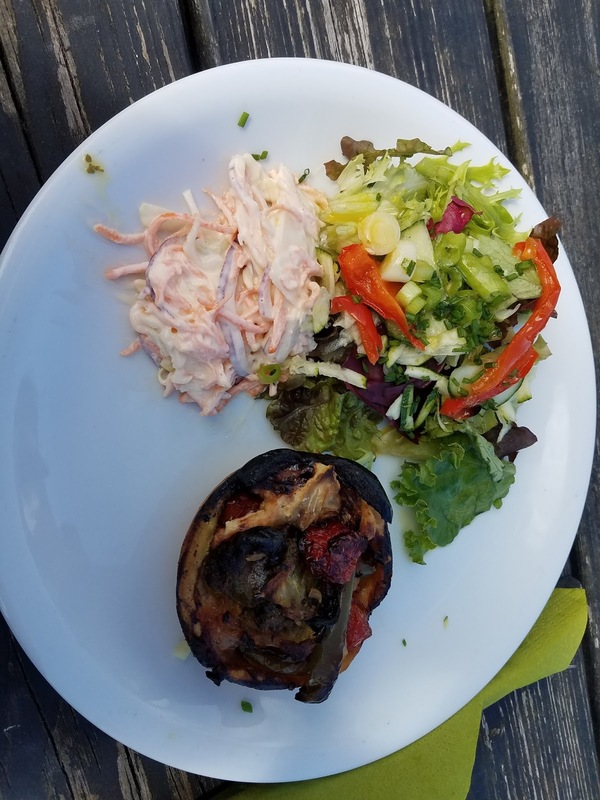 Plus, we got to eat it sitting in the grass in big open Scottish fields with cows, long distance bikers, and not much else in the distance. We could feel that we were somewhere special, though we perhaps did not anticipate how much adventure (see, smashing a rearview mirror) we would have that day. It also turned out to be our most delicious meal on our whole big trip. For Valentine's day, we drove to another part of Washington we hadn't explored yet. 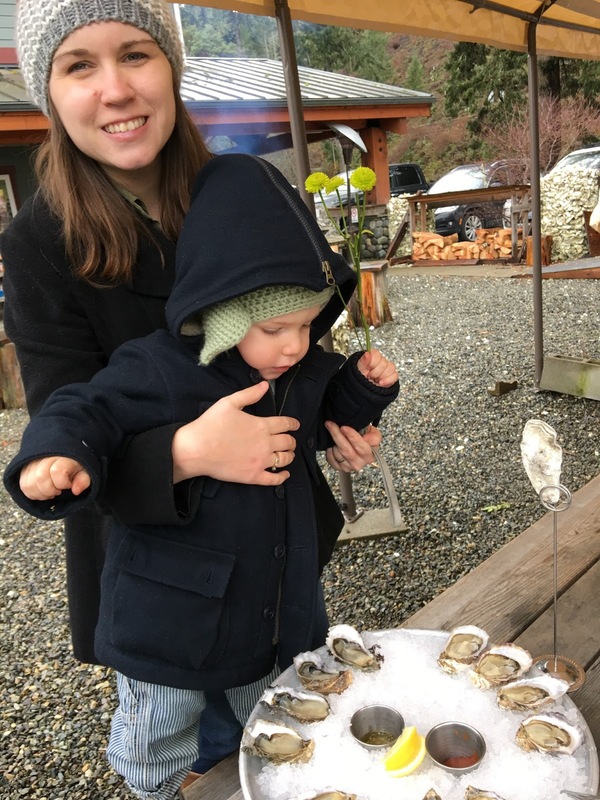 The trip, if we are being honest, was not super successful, but in our desperate (and blow out filled, if I remember right) drive to stay out of an air bnb not safe for kids, we stopped at the Hama Hama Oyster farm, which had an open air restaurant where you could drink hot apple cider and eat oyster shooters. 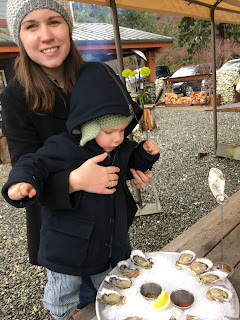 It was cold, but it was fun- we even got to walk on a big field of oyster shells after we were done! 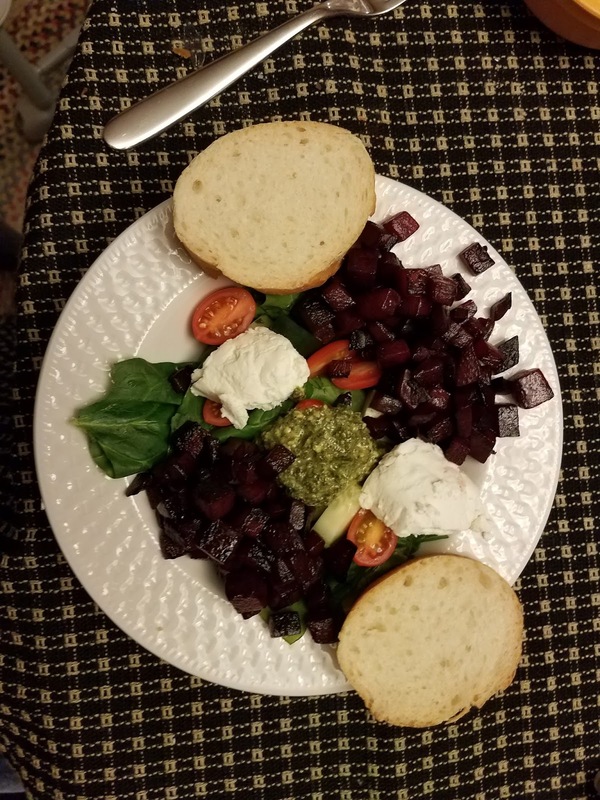 I tried a beet salad at Root Down in the Denver airport that basically shaped our entire year. 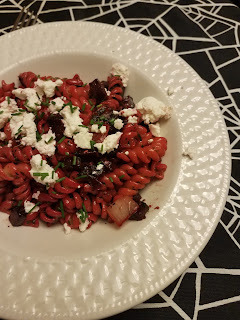 Beets, pesto, and goat cheese is the best combination ever, so we have tried our own salads, and a crazy amazing beets pasta that our kids beg for (no joke, they love it so much and they look like cannibals). Beets noodles makes me proud too, because it just goes to show you can try new things and have them be great. I never thought I would like beets, but like so many things, it just depends on how you make them and what you put with them. 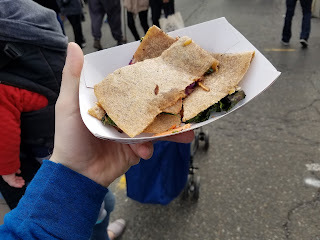 I even love these roasted veggie (see- beets) quesadillas, who would have ever expected! Now we eat them all the time. 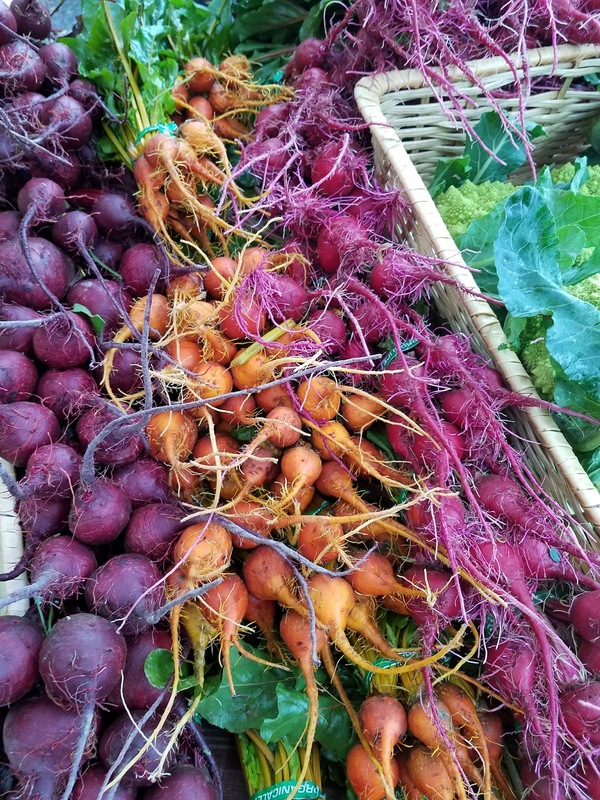 They can be so freaking good, and as my husband says, it is the year of the beet. This year, we took our sons to my grandparents' cabin in Maine for the first time. It was so fun to watch them play with my Grammy in the lake, throwing in rocks and watching for fish. One of the days there, we spent the morning at the lake with her, then we went to Portland in the afternoon, to play at the children's museum (milking the same cow I did as a kid! ), then we went to Eventide Oyster Co for dinner. 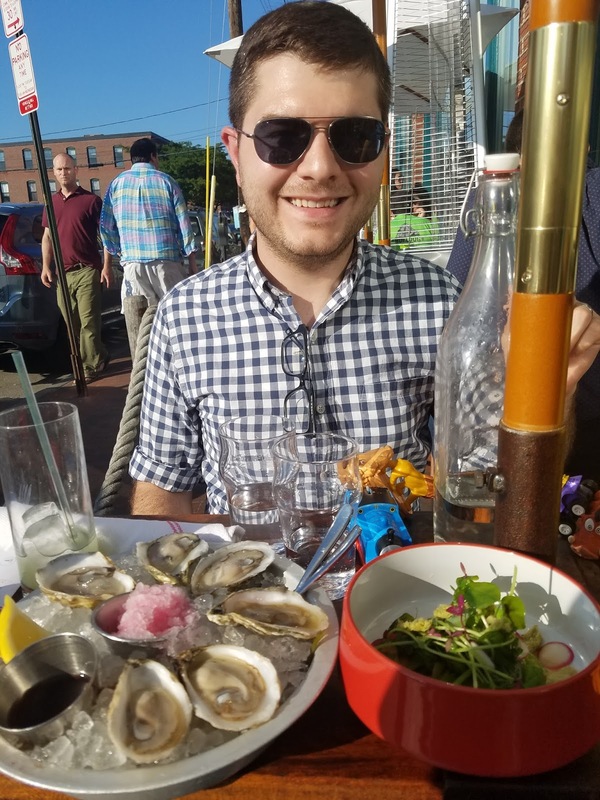 Who can fight with oyster shooters and Thomas the train? It was crazy awesome. First, God bless nice restaurants with outdoor seating, because we can bring our toddler craziness without stressing too much. 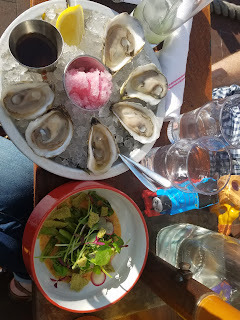 Even better if the food is awesome- we had oysters, a steamed bun lobster roll, and a ridiculously good tuna crudo. Snobby white people food? Yeah, probably, but we also had cheerios, so that balances it a little right? It can be hard to know what you can get away with when you have two very busy little boys, so it just felt good to share that with them and have them mostly really like it. The meal was just fun and laid back, and we had fun sitting in the sunshine and eating plate after plate. 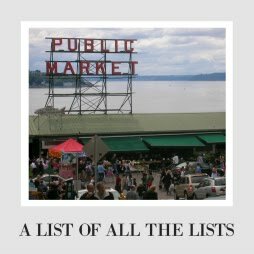 Ok, so reading my list is great and all, but you go make your list! What are some of your best or favorite meals this year? I LOVE this post, especially the reference to beets! 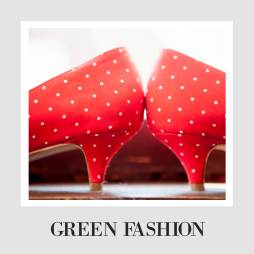 I adore your blog and am having a blast reading your blog posts. Do you have any beet recipes to share with Just Beet It? Feel free to shoot me an e-mail as I would love to feature you: aarika@justbeetit.com. Keep on being awesome!